This overlooked film is often described as a remake of the 1941 Corsican Brothers, or as based on Alexandre Dumas’s short novel of that name, but it’s actually a full-fledged sequel that stands on its own. Producer Richard Small had done well with low-budget sequels to his Count of Monte Cristo, so he tried the same trick with his Corsican Brothers, and with some success. It’s strictly to Small’s now-familiar formula, drawing heavily on elements of its predecessor and from Small’s similar Son of Monte Cristo. So it doesn’t cover any new ground, but it’s pretty enjoyable nonetheless, thanks mainly to the charm and intelligence of its star, Richard Greene—the same actor who would make such an indelible impression later in the decade starring in the title rôle of the Adventures of Robin Hood TV show. In some ways, this film can be regarded as an extended screen test for that part, with its engaging and clever hero, the fugitive noble Mario Franchi, leading a band of outlaws in a desperate fight against tyranny. 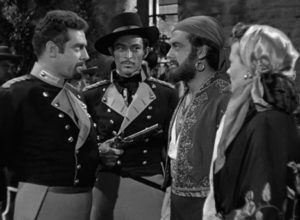 But this is yet another double-lead-rôle swashbuckler in which Greene plays not just Mario Franchi, but also his separated-at-birth twin brother Lucien, who, through his psychic connection to Mario, lives a tormented double life. Greene bases his tragic Lucien on Douglas Fairbanks, Jr.’s haunted performance in the 1941 film, and carries it off admirably. Set five years after the prequel, once again the Franchi brothers pit their doppelgänger hijinks against a ruthless aristocrat who wants to rule all Corsica, in this case Raymond Burr in the rôle of evil Baron Jonatto. Burr may not have the wicked gusto of Akim Tamiroff, the villain of the first film, or the urbane arrogance of George Sanders in Son of Monte Cristo, whom he’s clearly emulating, but he seems to be making an effort, and is more lively than usual. Better is his brutal lieutenant, Nerva, played by a young but steely Lee van Cleef, who often sneeringly steals the scene from his stolid boss. Count Mario has a comely but helpless countess (Paula Raymond), whose function is to be loved hopelessly by Lucien when she’s not being held captive by Jonatto. The plot is the standard mix of midnight raids, impersonations, abductions and escapes, villainous ultimatums, vows of vengeance, and a guards-oppressing-the-people montage, spiced with amnesia, Gypsies, a secret passage, and a dungeon torture chamber, all climaxing in a perfectly fine four-way sword fight. A well-worn tale, but solidly executed, and worth it for Greene and van Cleef.